Do +X/+X Effects persist through "Creature becomes X/X" spells? 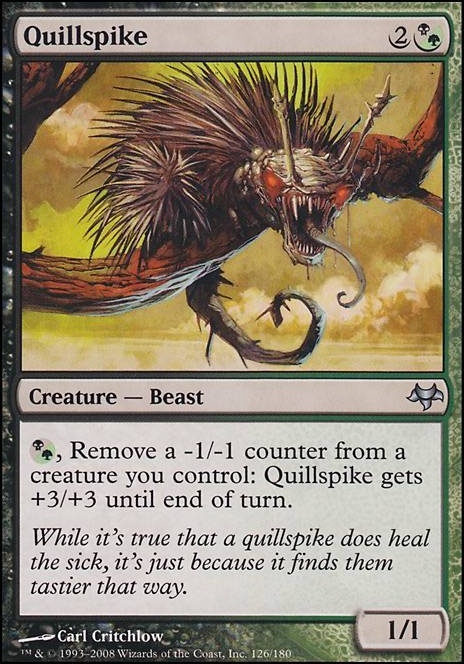 (B/G), Remove a -1/-1 counter from a creature you control: Quillspike gets +3/+3 until end of turn. Recently this Podcast did this episode on their personal spellbooks. I thought it would be cool if we did the same thing. I'm going to base mine just off cards that mean a lot to me or have been my favorites. Killing Wave - I love giving people bad choices to make and everyone underestimates these cards. Trust me after the 5th bad choice you have to make you'll be feeling the pain. Queen Marchesa - I had built a few half hearted pillow fort decks before finding her but she leads my first real pillowfort deck. A strategy that I rather enjoy. 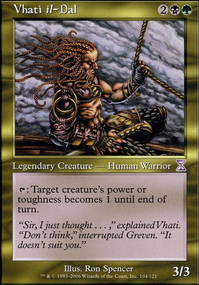 Mairsil, the Pretender - Leads my absolutely favorite deck. I've always loved doing weird combos and Mairsil combines cards in ways they are not meant to be. This leads to having the highest potential number of combos in a single deck. Shadowborn Apostle - I still haven't really settled on who I want as the commander of my Apostle deck but I always have fun charging in with these guys and then bringing out ridiculous demons later in the game. 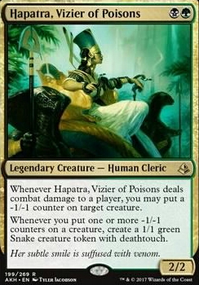 Vraska the Unseen - I just really like this character... She needs a version that can be my commander! Quillspike and Devoted Druid - Cheating here a bit since I'm counting this as one 'signature spell' but this is the first combo I remember discovering myself. In reality I was far from the first person to see it but I didn't know that. Stuffy Doll - I need this to be a legendary creature... It is just such an awesome card and so funny to me! Quillspike is a b/g card and not legal in this deck. how about Quillspike and Devoted Druid combo? Darth_Savage on Hapatra & Izoni. One of the advantages of Modern is that you can access a large pool of cards and find the most efficient option, but as a newer player those cards won't be necessarily known to you. That being said you have slipped into one of the bad habbits that most new players have; you aren't running 4x of any card in your deck, this reduces the consitency of your play. It might seem more interesting to have lots of different cards, but in the long run it actually hurts your deck. Now you happen to have chosen the theme of -1/-1 counters and these haven't actually played a major part of magic that often. One of the earlier sets to play around with them was Eventide, it featured: Twinblade Slasher, Quillspike, Woodlurker Mimic, Cauldron Haze, Noxious Hatchling, Soul Snuffers, Wickerbough Elder, Deity of Scars and finally Necroskitter. That is clearly a lot of cards, it isn't exaustive and I'm not suggesting you use them all, but I hope you can start to see the options in the Modern format. Every deck wants to draw cards, well from Shadowmoor there are two obvios cards that help you do that Dusk Urchins and Scarscale Ritual. 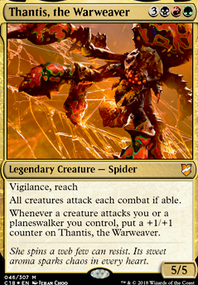 More up to date now, one card I was surprised you didn't include was Obelisk Spider, which strikes me as a good fit, then again another spider also struck me as a good fit, this time from Journey into Nyx, if you want tio utilise your graveyard Nyx Weaver. 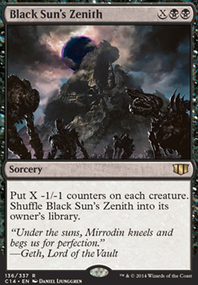 The biggest baddest -1/-1 spell though came from Mirrodin Besieged Black Sun's Zenith. This is just the start though, to give you a taste of what earlier sets might offer your deck. For now try to work out which cards you want to see in every opening hand and run four of them, then build the deck around those core cards. Good luck and enjoy brewing your deck. 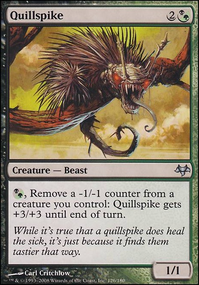 Get an arbitrarily large quillspike, add Obelisk Spider or hapatra for a better payoff. Add Parallel Lives, Zulaport Cutthroat, Blood Artist, Grave Pact, Ivy Lane Denizen, Obelisk Spider, or any similar card you enjoy. I go more in depth on all of this in my Mistress of Poisons primer. I retired the deck because my group is pretty casual and the deck won turn 3-5 a few times... Could do better with some tweaks. Cutted Quillspike from the list because it goes infinite with devoted druid and doesn’t do much else. After all this is still a casual deck and combos like this kill the fun and have their place in competitive decks.